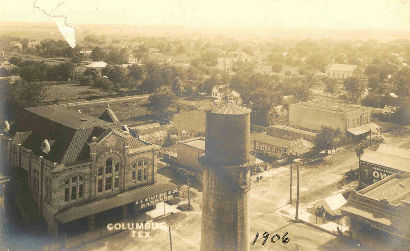 Columbus Tower, Columbus Texas History Photos. Writing by candle light, Capt. John Shropshire scratched out another letter to his beloved Carrie. The captain and his fellow Confederate soldiers had covered about 12 miles that November day in 1861, stopping to make camp on the Frio River about 60 miles from Fort Clark. The boys from Columbus were on their way to El Paso and eventually New Mexico. Shropshire knew it would be a long time before he held his wife in his arms again or saw their son, Charlie. “If peace is not declared before we leave [El Paso], we can not possibly get back before 12 mo…which to me appears an age to be separated from my family,” he wrote. Indeed, before the war, he had been a successful cotton grower. “But these are no times to long for the comforts of home,” he had continued. Early in the campaign, he had at least eaten well. “I managed to eat or worry down a small portion of a calf and also a pig which we pressed into the service of the Southern Confederacy,” he wrote. The day after Christmas, Shropshire wrote from a camp near the Rio Grande not far from Fort Quitman. Fighting Yankees would come, but for the time being, West Texas has proven a formidable adversary in its own right. When the smoke cleared after the Battle of Glorietta Pass, Shropshire indeed lay among the unfortunate who would never see Texas again. But his name did eventually become associated with a castle – at least a structure that looks like one. A round, white tower on the Colorado County courthouse square looks like an architectural survivor of the days of yore in England. No matter how European it looks, however, the tower is the product of Yankee – well, Southern – ingenuity. In the spring of 1883, two decades after the war that claimed Shropshire, a fire gutted a livery stable and adjoining hotel in Columbus. Volunteer fire fighters managed to contain the blaze before it leveled downtown, but getting enough water on the fire had been a problem. To provide the city a water system, the county commissioner’s court authorized construction of a brick water tower. Built by R.J. Jones, the tower took shape from 400,000 locally made bricks. The walls lack only four inches being three feet thick. 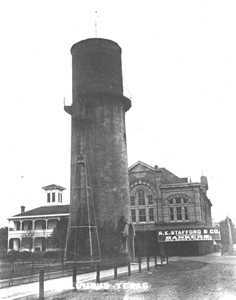 A metal water tank went atop the two-story brick tower. Beneath it, the city’s volunteer fire department had its office and equipment. A hurricane damaged the top of the tower in 1909. The county had the structure repaired, but three years later decided the city needed a better water system. With completion of that system, the tower stood abandoned. Eventually, the county hired someone to tear it down, but dynamite did not phase it. 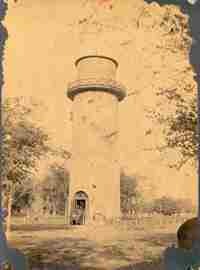 In 1926, it finally occurred to someone that the tower had other than utilitarian value. 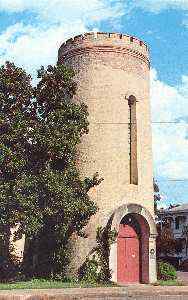 The officers of the John Shropshire and John C. Upton chapter of the United Daughters of the Confederacy got county officials to agree to let them use the tower as their meeting place. Local architect Milton Wirtz and contractor A.N. 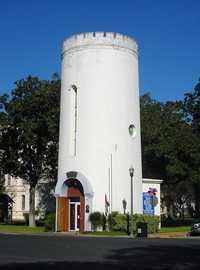 Evans Sr. refurbished the old tower, adding a small, rounded room on the east side of its base and a circular staircase leading to a second floor. 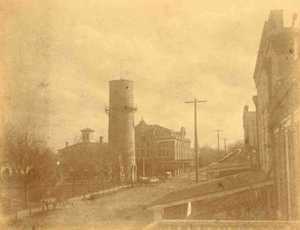 Since 1962, the tower has been the home of Columbus’ Confederate Memorial Museum and Veterans Hall. A photograph of Shropshire hangs on the museum wall, and his letters have been saved for posterity by Columbus’ Nesbitt Memorial Library.